Summon: Draw a card and reduce its cost to 0. Nahkriin, Dragon Priest is a unique legendary Intelligence creature card. It is part of the Core Set. This card's summon ability applies the Vengeance card effect. When your deck is empty, Nahkriin does not draw an Out of Cards, unlike other creatures that draw cards. 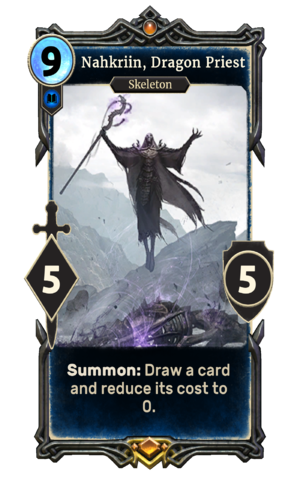 The card depicts and is named for a Dragon Priest who appears in Skyrim, Nahkriin. This card was previously called Dragon Priest in official pre-release material. This card originally cost 10, with the ability "Summon: Draw a card. The next card you play this turn is free.". It was changed in 11/2016 because the developers felt it was limiting future design space. This page was last modified on 6 March 2019, at 15:23.